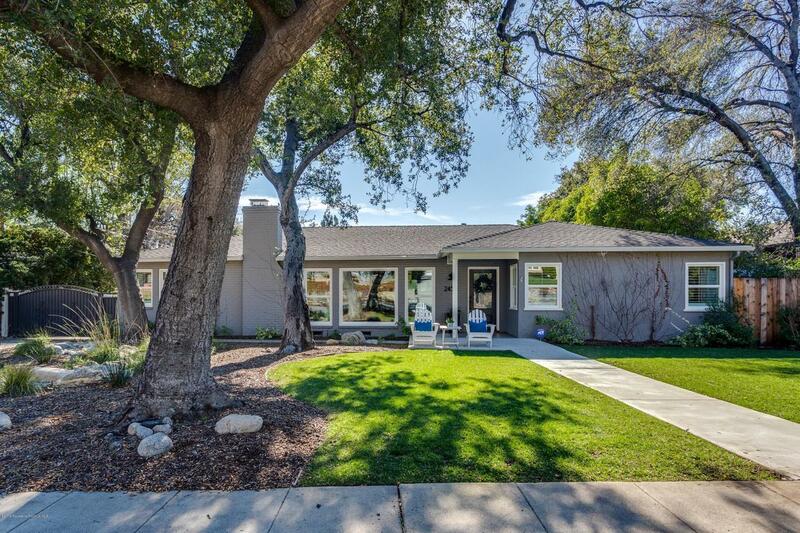 Stunning Midcentury on a beautiful tree-lined street in coveted Altadena. Completely renovated in 2017 throughout with designer finishes. This home offers 4 bedrooms and 2 bathrooms with a guest house off of the garage. Formal entry opens to a large livingroom and custom fireplace, with stunning mountain views. The kitchen boasts an impressive center island that seats six with quartz counter tops, Bertazzoni stainless steel appliances, Hansgrohe faucet and custom soft close cabinetry. The family room and dinning room are off of the kitchen that overlook the private deck and back yard. The master suite offers a large walk-in closet and master bath with Carrara marble dual vanity, glass enclosed shower and deep soaking tub. The other three bedrooms are generously sized and offer ample closet space. Gated driveway leads to a detached two-car garage and fully renovated guestroom with bathroom, perfect as an office or art studio. The back yard is an entertainer's dream with mountain views, custom redwood decking, large grass area and built in fireplace with bbq.